MINT, a designer of MINT NeKO was born in Shimane in 1984. 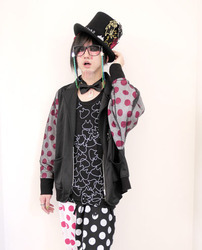 After graduating Bunka Fashion College, he became an assistant designer of h.NAOTO and made a debut as a designer of Sixh. in 2006. Fashion duet with the brand Sixh., MINT has created his own line called MINT NeKO. MINT NeKO uses oriental silhouette inspired by mode style with cat character graphics. There are actually more than 250 original kitty characters that are created and used in the garments. MINT has created cat to collaborate into the world of fashion. MINT has collaborated with many Japanese artists and is becoming one of the leading young designer in Japan.